“Toscano Panel I” is a long, horizontal piece by Art Fronckowiak. 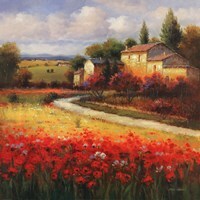 This self-taught artist is well known for his landscape art and this image is no exception to the excellent and realistic work that his fans have come to expect. 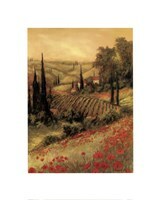 The painting is a contemporary piece, showing a dirt path running through a large field in Tuscany. The field is dotted with bright red poppies and the customary Cypress trees that have become a staple in Tuscany and the artwork that Art Fronckowiak creates to celebrate it. The sky beige sky appears hazy, giving the impression of a warm day in Italy. 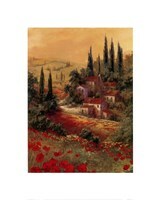 The colors of this image are warm and inviting, making it the perfect piece for over a mantel or couch in your Tuscan-styled home. A black frame would be a good finishing choice for contemporary décor styles, but a cherry or gold frame would also work for a more traditional look.